If I ever get to teach a class on visual rhetoric, which I might, I need to remember to use Scott McCloud’s work as a primary text. 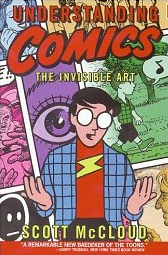 Does he really have a book called The Vocabulary of Comics? (Visual Rhetoric in a Digital World: A Critical Sourcebook says the eleventh chapter of this book is the second of The Vocabulary of Comics.) Or did the editors get this wrong and it is from Understanding Comics? I need to go look at my copy and see.